Camels are the most valuable livestock species in the Horn of Africa and play a pivotal role in the nutritional sustainability for millions of people. Their health status is therefore of utmost importance for the people living in this region. Streptococcus agalactiae, a Group B Streptococcus (GBS), is an important camel pathogen. Here we present the first epidemiological study based on genetic and phenotypic data from African camel derived GBS. Ninety-two GBS were characterized using multilocus sequence typing (MLST), capsular polysaccharide typing and in vitro antimicrobial susceptibility testing. We analysed the GBS using Bayesian linkage, phylogenetic and minimum spanning tree analyses and compared them with human GBS from East Africa in order to investigate the level of genetic exchange between GBS populations in the region. Camel GBS sequence types (STs) were distinct from other STs reported so far. We mapped specific STs and capsular types to major disease complexes caused by GBS. Widespread resistance (34%) to tetracycline was associated with acquisition of the tetM gene that is carried on a Tn916-like element, and observed primarily among GBS isolated from mastitis. The presence of tetM within different MLST clades suggests acquisition on multiple occasions. Wound infections and mastitis in camels associated with GBS are widespread and should ideally be treated with antimicrobials other than tetracycline in East Africa. In many semiarid and arid regions of the Horn of Africa, camel keeping is the most sustainable livestock enterprise. Due to climate change and desertification, cattle numbers are decreasing in such regions while camel numbers are increasing and are likely to play an even more significant role for human nutrition in the future . For the people living in these harsh dry areas, the camels play a pivotal role in survival as an important source of animal protein, especially milk and to a lesser extent meat, transportation, cultural status and financial reserve . People live in very close contacts with their animals and camel milk is traditionally consumed raw without proper heat-treatment, which poses a risk for acquiring infections with zoonotic pathogens . The potential risk of transmission of camel pathogens to humans therefore requires investigation. Streptococcus agalactiae, a Group B Streptococcus (GBS) is an important pathogen affecting humans and livestock species such as cattle. This pathogen has also been isolated from both healthy and diseased camels from the Horn of Africa [4–9]. The uncontrolled distribution and usage of antibiotics to treat bacterial livestock infections in the Horn of Africa  is likely to contribute to the emergence and transmission of antimicrobial resistance genes and requires further investigation . Data on antimicrobial susceptibility in camel GBS in Africa is scanty at best, with only few antibiotics tested on a limited number of samples . S. agalactiae possesses a polysaccharide capsule that can be divided into ten different types based on molecular typing . Certain capsular types have been associated with invasive disease or asymptomatic carriage. Capsular type III Streptococcus is predominant among the types causing invasive neonatal infections [13, 14]. However, capsular type V has also recently emerged as the cause of a significant proportion of invasive human infections in North America . This study aimed to gain insight into the genetic and phenotypic diversity of camel GBS isolates from East Africa in order to guide the development of diagnostic assays as well as vaccines and to provide data useful for informing antimicrobial treatment strategies for control of diseases in camels caused by GBS in the horn of Africa. We characterized 92 camel GBS isolates, their capsular types, tested their antibiotic resistance profile and the resistance genes. Additionally, we typed the isolates by multilocus sequence typing (MLST) and characterized their genetic diversity and genetic relationships in order to correlate genotypes/populations with capsular types, resistance profile and clinical symptoms. Moreover, we compared East African camel GBS with East African GBS isolated from humans . All work described was in full compliance with national regulations. The work was approved by the ethical committee of the International Livestock Research Institute, which adheres to international standards and is accredited by the National Council of Science and Technology in Kenya (approval number ILRI-IREC2013-12). Information about the 92 camel GBS isolates used in this study is provided in Additional file 1. The GBS were isolated using standard methods  and the species level (GBS) was determined using Lancefield serological grouping as described before [4, 5]. Briefly, specimen material was streaked out on Edwards agar plates (Oxoid No. CM0027) containing 5% defibrillated sheep blood. Plates were examined after 24 and 48 h of incubation at 37 °C. Small blue and beta hemolytic colonies were subcultured for further testing. Gram-positive and catalase-negative cocci that were unable to hydrolyze esculin and reacted positive when subjected to Lancefield B testing using Oxoid No. DR587 Latex Grouping Reagent B were considered to be Streptococcus agalactiae (GBS). The isolates were grown in 10 mL Luria Broth (LB) over night at 37 °C. Culture material was centrifuged at 4 °C and 8000 g for 10 min, the supernatant was discarded and the cell pellet was resuspended in 275 μL H2O, 10 μL RNAse A (10 mg/mL) and 275 μL TEN buffer (0.05 M Tris, pH 8.0, 0.001 M EDTA, 0.016 M NaCl, 100 mg/mL Lysozyme). The solution was incubated at 37 °C for 30 min, 15 μL 20% SDS and 10 μL proteinase K (20 mg/mL) were added, mixed and the solution was incubated at 37°C for 60 min. 125 μL of 4 M NaCl and 80 μL CTAB solution (10% in H2O, preheated to 50°C) were added, mixed and the solution was incubated at 65°C for 10 min. A phenol/chloroform extraction followed by a DNA precipitation using ethanol according to standard protocols . The DNA pellet was resuspended in TE (pH 8.0) buffer and stored at -80 °C for subsequent use. The susceptibility of the camel streptococcal isolates to 23 different antimicrobials, listed in Table 1, was assessed phenotypically using broth microdilution method according to CLSI document M31-A3 . Briefly, Sensititre® microtiter plates containing the antimicrobial agents in a vacuum dried form and cation-adjusted Mueller-Hinton Broth supplemented with 2% lysed horse blood (Trek Diagnostic Systems) were used. An inoculation density of 2–8 × 105 CFU/mL was prepared according to CLSI standards. Plates were inoculated using the Sensititre® inoculation system, sealed with a plastic foil and incubated under aerobic conditions at 37 °C for 24 h. We included Staphylococcus aureus ATCC 29213 and Streptococcus pneumonie ATCC49619 as quality control strains. Since clinical veterinary breakpoints are not available for camels we used the wild type cut-off values for ampicillin, cefoperazone, clindamycin, cefotaxime, erythromycin, tetracycline and vancomycin provided by EUCAST  as well as CLSI clinical breakpoints provided for animals  (Table 1) for interpretation of results. ECOFF-epidemiological cut-off value (retrieved from the European Committee on Antimicrobial Susceptability Testing), CLSI CBP-CLSI M31-A3 veterinary clinical breakpoint for resistance, MIC90-Minimum Inhibitory Concentration required to inhibit the growth of 90% of organisms, ND-not determined, GBS-Group B Streptococcus agalactiae, AMC-Amoxicillin-clavulanic acid (2:1 ratio), AMP-Ampicillin, CEF – Cephalothin, CFP - Cefoperazone, CFQ – Cefquinome, CHL – Chloramphenicol, CLI – Clindamycin, CTX – Cefotaxime, ENR – Enrofloxacin, ERY – Erythromycin, GEN – Gentamicin, OXA – Oxacillin + 2% NaCl, PEN – Penicillin, PIRL – Pirlimycin, Q-D - Quinupristin/Dalfopristin, SPI – Spiramycin, SXT - Trimethoprim/Sulfamethoxazole, TET – Tetracycline, TIL – Tilmicosin, TUL – Tulathromycin, TYL – Tylosin, VAN – Vancomycin, XNL – Ceftiofur. The presence of the common genes reported to confer resistance to tetracycline i.e. tetM and tetO, was investigated in camel isolates phenotypically resistant to tetracycline using PCR amplification as described previously . Twenty nanograms of genomic DNA was used as template in a final volume of 50 μL of PCR master mix containing; 1 × PCR buffer (DreamTaq™including MgCl2, Fermentas, Germany) 200 μM of dNTP; 600 nM each of the forward/reverse primers and 1.25 U of DreamTaq™ DNA Polymerase. The amplification conditions were as follows; denaturation for 3 min at 95 °C, followed by 35 cycles of 95 °C for 1 min, 48/55 °C for 1 min for tetM/ tetO respectively, and 72 °C for 1 min with a final extension of 72 °C for 10 min. Positive controls strains for tetM and tetO PCRs were S. agalactiae 2603 V/R  and Streptococcus anginosus MG23 , respectively. Selected PCR products were sequenced and trimmed from position 865 to 1075 in tetM of strain 2603 V/R (GenBank Accession Number: NC_004116). A possible location of the tetM gene within a Tn916-like element was evaluated using a PCR spanning from the tetM gene (tetM 3-end: 5′-ACTACCGGTGAACCTGTTTG-3′) to the transposase (Tn916 tnase: 5′-TGGCTCTCTCCAGTCTTTAAG-3′). The expected PCR product was 2,740 bp long. PCR conditions were as outlined above with the difference that the annealing temperature was 58 °C and the extension time was set to 3 min. Positive control strain for Tn916 was Staphylococcus rostri RST11 . Capsular polysaccharide gene types (cps) were determined using a multiplex PCR assay as described previously  using DreamTaq™ DNA Polymerase. Amplified products were separated on a 1.5% agarose gel and the band pattern of the isolates were compared to the band pattern of the GBS reference isolates included in this study representing all known capsular types; Ia, Ib, II, III, IV, V, VI, VII, VIII and IX . The MLST was performed as described previously . Briefly, seven S. agalactiae housekeeping gene loci were amplified, including alcohol dehydrogenase (adhP), phenylalanyl tRNA synthetase (pheS), amino acid transporter (atr), glutamine synthetase (glnA), serine dehydratase (sdhA), glucose kinase (glcK) and transketolase (tkt). The PCR amplification was carried out in duplicate (50 μL reaction volume) using GoTaq® Green master mix polymerase (Promega, USA) according to manufacturers’ instructions. PCR products were purified using a QIAquick PCR purification kit (QIAGEN, Germany) and sequenced by Macrogen Inc. (Seoul, Korea). Sequence traces were assembled using the CLC workbench 6. Individual alleles of the camel isolates were compared to the MLST database entries and novel alleles were assigned new allele numbers. New combinations of alleles were also assigned new sequence type (ST) numbers. All camel isolates were submitted to the MLST database . To visualize the genetic relationship between camel GBS, MSTs were generated from the allelic profiles of the different isolates using the predefined settings in BioNumerics® 6.6. The clonal complex/populations, capsular type (Ia, Ib, II, III, IV, V, VI, VII, VIII and IX), tetracycline resistance (resistant or susceptible) and clinical complex (chronic cough, mastitis, wound infection/abscess/peri-arthricular abscess, gingivitis, vaginal discharge and healthy camels) were plotted onto the minimum spanning tree using different color codes. We compared the camel GBS with other published MLST-typed GBS from East Africa . A concatenated sequence of each ST was generated using MLST data from this study and from elsewhere . Jmodeltest 1.0  was used to select the best fitting model of nucleotide substitution, which was found to be the Generalized Time Reversible model with invariant sites and gamma-distributed rate heterogeneity (GTR + I + G) . A maximum likelihood phylogeny for all STs was estimated using this model in PhyML 3.0 . To assess statistical support for the resulting phylogeny, we performed 1000 bootstrap replicates. The tree was drawn using the software FigTree v1.3.1 . For this analysis we included 169 human isolates , which were MLST-typed before in order to investigate a possible gene flow between camel and human GBS. The population structure was estimated using the linkage model in STRUCTURE v2.3.2 [30, 31]. This Bayesian approach uses multilocus genotypic data to define a set of populations with distinct allele frequencies, and assigns isolates probabilistically to defined populations without prior knowledge of sampling location or sampled host. This program identifies admixtures of isolates and provides an estimate of the percentage ancestry from ancestral population for each isolate. We performed eight replications of the test, in which we initially discarded 10 000 Markov Chain Monte Carlo (MCMC) iterations as burn-in and kept the subsequent samples from 30 000 MCMC iterations for analysis. We tested values of K between 1 and 10, where K is the number of inferred populations. The results of the eight independent runs were averaged for each K value to determine the model with the highest likelihood. Real and simulated data have shown that it is not straightforward to determine the optimal value of K when complex population structure is present [30, 32] so we also calculated ΔK, a measure of the second order rate of change in the likelihood of K  to estimate the appropriate K value for our data. The susceptibility profiles for 90 out of 92 camel GBS isolates against 23 antimicrobials are presented in Table 1 and Additional file 2. Two strains showed poor growth in Mueller-Hinton Broth with lysed horse blood and were therefore excluded from analysis of minimal inhibitory concentrations (MIC). The interpretation of data is hampered by the absence of clinical breakpoints for camels. We included the epidemiological criterion (wild type cut-offs, ECOFF) for interpretation of data, which unfortunately was only available for a fraction of antimicrobials tested. This criterion was determined on the basis of human strains and a different methodology than the one applied in this study. However, on the basis of veterinary clinical breakpoints available for streptococci  and MIC90 values determined in this study, only resistance to gentamicin and tetracycline is obvious (Table 1). In fact, 34% of the GBS isolates were resistant to tetracycline. One isolate (ILRI029, ST-617, capsular type VI) showed reduced sensitivity to all β-lactam antibiotics tested, probably due to a mutation in the gene pbp, encoding the penicillin binding protein. As expected most GBS isolates showed relatively high MIC to gentamicin in the range of 8–64 mg/L that is characteristic to the genus Streptococcus. For all other antimicrobial agents investigated, MIC distributions were normal. All tetracycline-resistant camel GBS harboured the tetM gene. All camel GBS were negative for tetO. The 211 bp sequence obtained from the tetM amplicon was 100% identical between the isolates investigated (N = 17) and 100% identical to other tetM sequences in the database from Staphylococcus aureus and S. agalactiae (e.g. GenBank accession number: NC_004116 and CP003808). In addition, we showed that, in all tetracycline-resistant camel GBS, tetM was linked to the Tn916 transposase, pointing towards a transfer of the resistance gene via a Tn916-like element. We assigned a capsular type to all but one camel GBS isolate (ILRI041). The capsular types detected included Ia, II, III, V and VI. The most common types were Ia (37%, 34 isolates), III (27%, 25 isolates) and VI (26%, 24 isolates). Type II and V were less commonly detected with only 4% of the isolates (4 isolates each) being positive for the respective types. Capsular types Ib, IV, VII, VIII and IX were not present among the camel isolates tested. Among all 92 camel GBS isolates, fourteen novel alleles were identified by MLST of seven S. agalactiae housekeeping gene loci (adhP, pheS, atr, glnA, sdhA, glcK and tkt)  (Table 2). All camel isolates differed from GBS currently deposited in the MLST database in alleles of the gene loci glcK, glnA and pheS. A total of 10 new unique sequence types (STs), named ST-609 through ST-618, were identified; the most common STs were ST-617 (29%, 27 isolates), ST-616 (26%, 24 isolates) and ST-612 (26%, 24 isolates). Four isolates belonged to ST-615 and ST-613, respectively, while only two isolates belonged to ST-614, ST-611, ST-610 and ST-609 respectively. Only one isolate represented ST-618 (Additional file 1). Camel specific alleles and sequence types (STs) are displayed in bold. TUL – Tulathromycin, TYL – Tylosin, VAN – Vancomycin. According to the minimum spanning tree (MST) network and the number of shared alleles, the ten camel STs clustered in three clonal complexes/populations consisting of ST-609/ST-614, ST-616 and the remaining seven STs that had six alleles in common (Figure 1A). 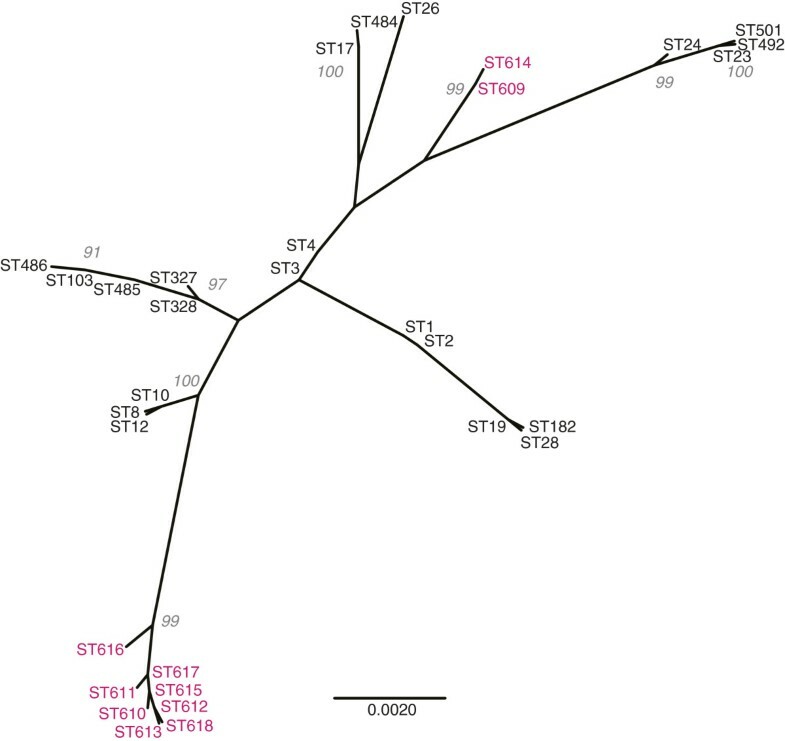 ST-609 and ST-614 were most distantly related to the other camel ST-609 and shared only 2 alleles with ST-616 (Figure 1A). Minimum spanning tree (MSTree) of East African isolates of camel S. agalactiae . Each circle represents a single sequence type (ST), its size is proportional to the number of isolates. The topological organization within the MSTree is based on a graphical algorithm using an iterative network approach to identify sequential links of increasing distance. (A) clonal complex, (B) capsular type, (C) resistance to tetracycline, and (D) clinical symptoms. The ten STs that grouped into 3 clonal complexes were further plotted against capsular type, resistance to tetracycline and clinical complexes. Capsular type Ia was predominant in isolates with ST-618, ST-613 and ST-612, while capsular type VI was most common in isolates with ST-610 and ST-617 (Figure 1B). Isolates with capsular type II were of ST-612 and ST-615. All isolates within ST-616 belonged to capsular type III while all isolates with ST-609/ST-614 belonged to capsular type V (Figure 1B). Tetracycline resistant isolates were found within ST-612 (4%; 1 out of 24) and ST-617 (30%; 8 out of 26), however the majority of the resistant isolates were grouped within ST-616 (92%; 22 out of 24) representing a total of 71% of all resistant GBS (Figure 1C). Interestingly, most of the GBS isolated from cases of mastitis (81% of mastitis isolates) belonged to ST-616 (Figure 1D). Wound infection and abscesses were found mainly in STs other than ST-616. No association between STs and geographical origin of the GBS isolates could be detected (data not shown). To investigate the relationship between camel GBS and other GBS from the region, we compared our dataset to previously described human GBS from Kenya . A maximum likelihood (ML) phylogeny was generated using a total of 33 STs (10 camel GBS STs and 23 human GBS STs ). An unrooted tree clearly showed that all camel GBS group in two well supported clusters that are phylogenetically distinct from the Kenyan human GBS (Figure 2). One cluster comprises ST-609/ST-614, the other one all the other isolates. Unrooted phylogenetic tree displaying the phylogenetic relationship of the East African camel and human S. agalactiae isolates. Camel STs are displayed in colour. The bootstrap values above 90 are displayed. In order to look for evidence of genetic exchange between camel and human GBS, we performed a STRUCTURE analysis. Calculation of ΔK produced a modal value for K = 7, whereas the averaged highest likelihood for eight independent runs was obtained for K = 8. We therefore present results for both K = 7 and K = 8 in Figure 3. 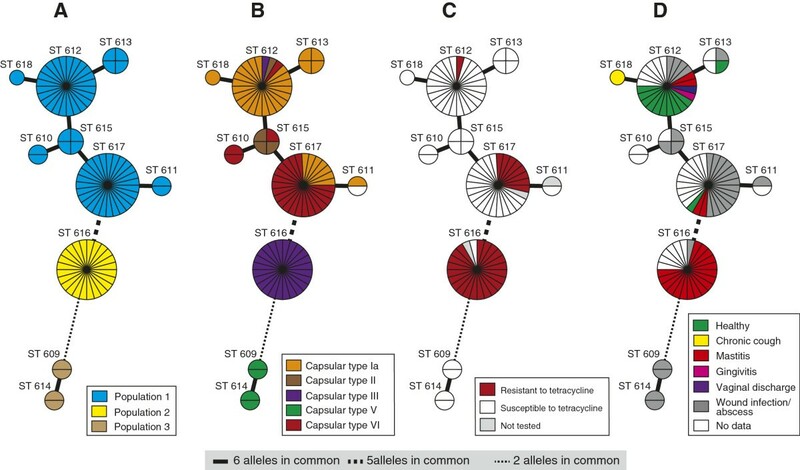 The seven populations in common for both analyses were; two populations of camel isolates only, corresponding to 2 of the clonal complexes identified on Figure 1A, containing 64 and 24 isolates respectively. All 24 isolates belonging to the second population are of capsular type III, whereas 63 of the 64 isolates belonging to the first population are of capsular type Ia, II, IV or VI. The remaining isolate could not be assigned to a distinct capsular type. Four populations consisted only of human isolates, corresponding to previously defined clonal complexes . The last population consisted of seven isolates, four from camels (ST-609/ST-614) and three from humans, all belonging to capsular type V. These isolates are hybrids with mixed ancestry, the camel isolates having at least 36% shared ancestry with human isolates. The human clonal complexes CC1 and CC19 , formed one population for K = 7, but were split into two distinct populations for K = 8. Population structure of 92 East African camel GBS and 169 Kenyan human GBS. The populations revealed by the STRUCTURE analysis using the linkage model and sequences from 7 house-keeping gene fragments are displayed below the figure and marked with different colours, the hosts are displayed above. The ancestral parts of each isolate are displayed in vertical lines. The STs are displayed for every population. With a population of many million animals, camels represent a major livestock species in the Horn of Africa. The diet of people living in semiarid and arid regions in the Horn of Africa is to a large extent based on raw camel milk. Therefore, the health status of the camel and specifically of its mammary glands is important for human nutrition in the region. The mapping of capsular types, clinical complexes, and antimicrobial resistance to specific MLST generated sequence types revealed interesting insights into the molecular epidemiology of GBS from camels. We identified three clonal complexes/populations within the camel GBS (Figure 1). The biggest population comprising 64 isolates encompassed four capsular types and isolates from diseased and healthy animals. Abscesses and wound infections accounted for the majority of clinical isolates within this population. The second largest population consisted of 26 isolates, which all belonged to the ST-616 and were of capsular type III only. This population consisted of clinical isolates only, originating from milk of mastitic camels. This population showed the least diversity in terms of capsular types, and clinical complexes and is of most importance to the livestock keeper, since mastitis is the main constraint for productivity of camels. The third population detected in this study contains ST-609 and ST-614. When compared to human isolates, the four camel isolates accounting for STs ST-609 and ST-614 clustered in one population with human GBS isolated in Kenya. The four human isolates belonged to ST-26 and to capsular type V. These isolates represent hybrids of mixed ancestry (Figure 3), pointing towards a high plasticity of S. agalactiae and the possible occurrence of genetic exchange . Nevertheless, only three alleles are shared between the camel and human strains within this population, and camel strains are clearly distinct from human strains on the phylogenetic tree (boostrap values on Figure 2). Another study showed that, even if bovine and human strains share all seven alleles of the MLST scheme, they represent distinct lineages, as demonstrated by including more housekeeping genes . Therefore, our data do not provide evidence of cross-species transmission of camel GBS to humans or vice-versa. Nevertheless, GBS from people in intimate contact with camels or camel products should be collected and compared to these strains in order to completely rule out such a possibility. In order to advise animal holders, caretakers and veterinarians on the best options to treat GBS infections in camels we investigated the susceptibility to 23 anti-microbial drugs used in veterinary and human medicine. Clinical breakpoints which are animal species and disease specific  are unfortunately not available for camels. However, the CLSI clinical breakpoints available for streptococci from animal species other than camels  as well as the high MIC90 values for tetracycline (64 mg/L) and gentamicin (32 mg/L) indicated resistance to these antimicrobials. While the resistance to gentamicin is genus specific and hence expected we additionally detected resistance to tetracycline in 34% of all camel GBS tested. According to EUCAST ECOFF values the MIC90 value for tetracycline was high above the cut-off supporting the finding of acquired resistance to tetracycline. Two previous reports based on relatively low numbers of isolates and antimicrobials tested via agar diffusion sensitivity testing reported a higher prevalence of tetracycline resistant isolates (44% to 53%) which might be attributed to the low number of isolates tested, the method used or the sampling scheme . Resistance to tetracycline was detected in three different STs within the two large clonal complexes/populations. Interestingly, not all isolates from any of the three STs were resistant. Most resistant isolates (71%) belonged to the mastitis causing isolates of ST-616. We showed that resistance was conferred by the gene tetM. The latter has been reported to be characteristic for resistance against tetracycline especially in human GBS . Interestingly, the presence of the tetM gene in three different STs, which represent two distinct populations, suggests a repeated acquisition of the tetM gene via transposition by a Tn916-like element as indicated by our PCR results . Our current data do not provide a conclusive picture on the source of tetracycline resistance genes detected in camel GBS. Sequence analysis of the flanking regions of tetM via full genome sequencing might help in answering this question . Tetracycline is a broad spectrum antimicrobial commonly used to treat bacterial infections in animals in the Horn of Africa. The use of tetracycline and other antimicrobials is not as regulated and closely monitored as in the industrialized world and the entry of antimicrobial residues into the food chain is therefore difficult to control. Our findings show that mastitis in camels caused by GBS should be treated with antimicrobials other than tetracycline to prevent the further spread of tetracycline resistant clones. Alternative drugs are increasingly available in pastoralist regions of East Africa and should be favoured to tetracycline for treatment of mastitis caused by GBS. However, it has to be noted in this respect that one camel GBS isolate of our study revealed an increased MIC to β-lactam antibiotics, assumingly a first step to resistance, indicating that use of this kind of antibiotics in the region might also lead to resistance problems. Given the increasing importance of camels as dairy animals, and the limitations and risks of parenteral and intra-mammary antibiotic treatments for camel mastitis, long term research into alternative disease control options such as vaccination combined with specific point of care diagnostic tests is highly desirable and timely. In this respect, antigens of capsular type III GBS are a good starting point  and require further characterization regarding their potential use in glycogonjugated vaccines or as diagnostics molecules. A vaccine against all camel capsular types would be desirable but is likely to be even more challenging. Camel GBS should be added to pangenome studies of GBS since they are more distantly related to human strains than livestock species such as cattle given the number of shared alleles . Whole genome sequencing and analysis of camel GBS might reveal supplementary biochemical pathways and functions that are not essential for bacterial survival but which might explain the origin of antibiotic resistance genes or reveal colonization factors necessary to infect the camel. In addition, genome data will allow to identify molecular targets specific to camel GBS for diagnostic tool development. Camel GBS sequence types (STs) were distinct from STs reported from other hosts so far. Most mastitis causing GBS were associated with ST-616. Widespread resistance (34%) to tetracycline was most prominent in ST-616 and associated with acquisition of tetM carried on a Tn916-like element. The presence of tetM within different MLST clades suggests acquisition on multiple occasions. Wound infections and mastitis in East African camels associated with GBS should be treated with antimicrobials other than tetracycline in East Africa. Anne Fischer, Anne Liljander contributed equally to this work. This work was supported by the German Federal Ministry for Economic Cooperation and Development funded the work (Contract No: 81095238, Project No: 04.7880.2-001.00) and the Consultative Group for International Agricultural Research (CGIAR) program "Safe Food, Fair Food". The Centrum of International Migration (CIM) supported Anne Fischer. The authors acknowledge support from CGIAR Research Program Agriculture for Health and Nutrition. We thank Analabs, Kenya for storage of camel S. agalactiae provided for this study. We thank Martin Norling for bioinformatics assistance. We thank Marc Ciosi for comments on an earlier version of the manuscript. JJ conceived and designed the study. AL, CM, HK, JF, JJ performed the experiments. AF, AL, HK, JJ analysed the data. AF, CAH, CD, EB-R, EdV, HHF, HK, JF, MY, RB contributed reagents/materials/analysis tools. AF, AL, JJ drafted the manuscript. All authors read and approved the final manuscript.